[vc_row][vc_column][vc_column_text]Finding the right combination of coverage, when it comes to your make-up and foundation needs, can be an interesting journey. Whether you’re looking to cover acne or just even out skin tone, finding the right foundation is critical in your skin care and make-up routine. Debony Salon works with a variety of clients from brides to a more aging clientele to younger guests dealing with skin imperfections, such as acne, active clients and more. It’s important to meet all of their make-up needs and help fit them into their daily routine. We’re incredibly proud of the extensive line of Jane Iredale make-up we carry. With over one hundred products from eye shadow to lipstick to foundation, you’re sure to find just what you’re looking for, and if you don’t, let us know. We can order it for you. 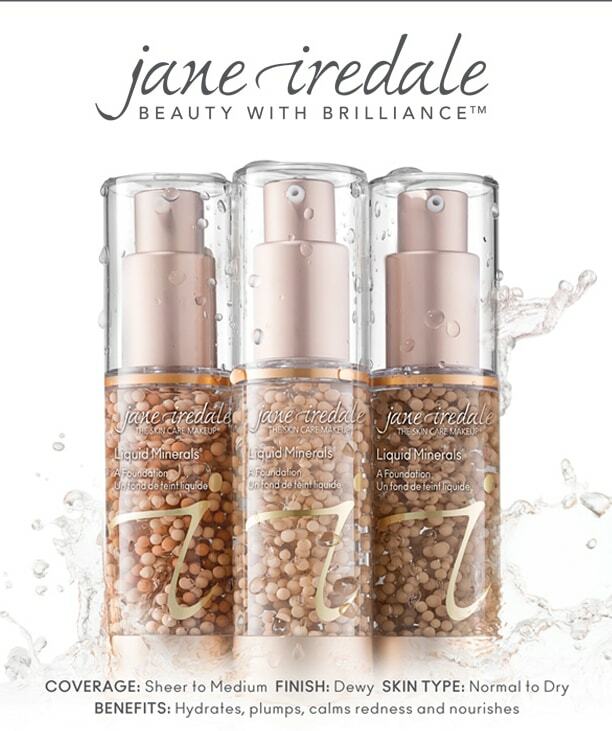 Jane Iredale carries multiple liquid and powder foundations for multiple different uses. Ranging from light-weight to full coverage, each one offers its own unique value. Liquid Minerals is a sheer to medium coverage. Made with Hyaluronic Acid, Vitamin C and Coenzyme Q10 to help attract moisture into the skin, reverse signs of aging and protect your skin. The Dream Tint, Tinted Moisturizer, is a hydrating, lightweight, water-resistant tinted moisturizer with the power of SPF 15. Glow Time foundation covers blemishes, minimizes pores, disguises wrinkles, and smoothes and brightens skin. Using Grapefruit Extract to minimize the appearance of pores and wrinkles and Apple Extract as a skin-smoothing antioxidant; Glow Time is the ultimate supporter of smoothing and moisturizing fine lines. Also containing broad spectrum sunscreen with SPF 25 UVB/UVA, its a foundation and sunscreen in one. It’s most often paired with the Smooth Affair primer for oily or normal skin. The Smooth Affair Primer brings out your natural radiance and evens out skin tone. It also minimize pores, and visibly reduces fine lines for a smooth, matte finish. Smooth Affair for Oily Skin also fights blemishes and reduces shine. 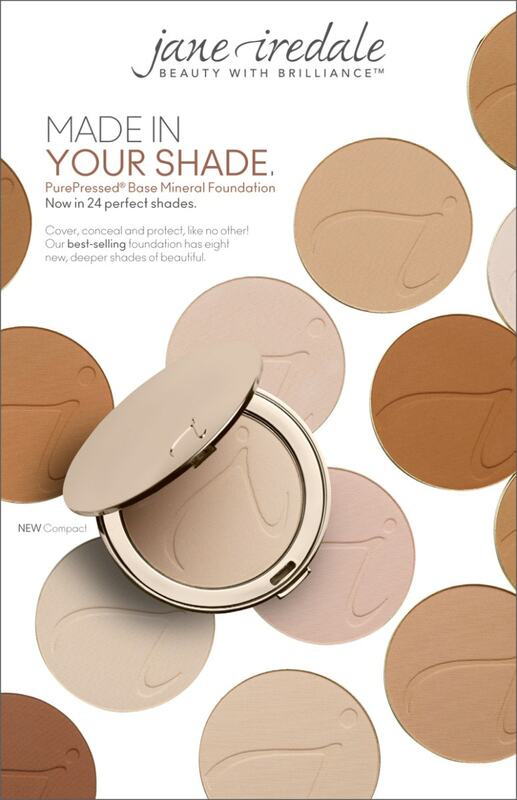 PurePressed Base Mineral Foundation offers a matte and weightless foundation. It’s water resistant to 40 minutes and a foundation, powder, concealer and broad spectrum sunscreen. This base is especially powerful because of its ability to work as a concealer and sun protectant in one, with Pomegranate Extract to protect and minimize UV damage. The Amazing Base is a powdered foundation offering medium coverage. It’s made triple threat as a foundation, powder, concealer and broad spectrum sunscreen with SPF 20 UVB/UVA all in one. It also conceals redness, and diffuses the appearance of fine lines, and pores with soft focus effect. Here’s our best advice for when to use these different foundation options. Glow Time and the Smooth Affair Primer are the best choices for brides who will be standing the test of a long night of dancing, and photographs as well as clients dealing with skin breakouts. Both of these products offer maximum coverage while still blending and creating a seamless look with your make-up. Liquid Minerals is great for aging skin because of how hydrating it is. It plumps fine lines and is light-reflecting, increasing your skin’s luminosity. The Dream Tint is a fantastic option for those looking for lightweight coverage with an SPF built into it. This specific foundation is great for those that are on the go, looking for a minimalistic look or for those that work or play outside in the sun the majority of the day. The Amazing Base is your best friend if your skin is inflamed and you suffer from chronic redness from acne or Rosacea. While the PurePressed Base is a great option if you’re looking for coverage without feeling any weight on your skin.